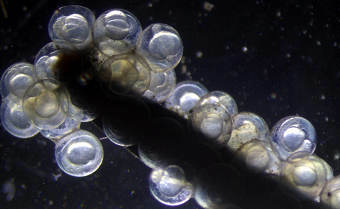 Scientists at Western Washington University are investigating the effect of ocean acidification and increased water temperature on Pacific herring embryo development. Dr. Brooke Love and graduate student Cristina Villalobos fertilized herring eggs in the lab and compared measurements of embryo development and health in elevated temperature, acidified water, and in a multi-stressor treatment with both elevated temperature and acidified water. They predicted that the multi-stressor treatment would reveal different developmental anomalies not observed in the single stressor treatments. Love and Villalobos found that larvae, on average, were shorter in water at 16 degrees Celsius (60.8 degrees Fahrenheit) than at 10 degrees Celsius (50 degrees Fahrenheit). The embryonic stage was also shorter and there were more frequent morphological deformities in their spine and jaw. “Increased temperature is the primary concern,” when considering climate change impacts on herring embryo development, says Love. The findings were presented last April at the 2018 Salish Sea Ecosystem Conference in Seattle. According to Villalobos, changes in embryo morphology may cascade through a population. “If the herring larvae cannot properly swim or feed then I think we'll see lower population abundances in adult herring and their spawn,” Villalobos said. Decreases in herring populations can ripple throughout an ecosystem, and less herring means less food for many Salish Sea species. In the multi-stressor treatments, where the water was warmer and more acidic, the developing embryos had higher rates of respiration. If embryos are dedicating energy to regulating respiration when they are stressed, they may direct less energy to development, resulting in shorter larvae. “Shorter larvae may not necessarily have a negative effect on populations,” Villalobos said, if other factors such as increased food supply can outweigh the negatives. In a related study, Atlantic herring reared in “variable pH conditions seemed to do well enough with high food availability. But, this is definitely in the realm of future research,” said Villalobos. Researchers are still trying to determine what effect warming oceans will have on plankton, the tiny organisms that small fish like baby herring eat. Funding and support for this article was provided by the Environmental Protection Agency's National Estuary Program and the 2018 Salish Sea Ecosystem Conference. Genoa Sullaway is a marine ecologist with a MS in Ecology from San Diego State. She is currently working as a contractor at NOAA NWFSC in Seattle and as support staff for the Ocean Modeling Forum at the University of Washington. She can be reached on Twitter @genoa_sully.